We are less than three weeks away from WWE's grandest event WrestleMania 35. It's high time when World Wrestling Entertainment should make almost all match booking done within this week. This past episode of Monday Night Raw was fair enough in giving proper flow to the storyline for WrestleMania 35. Let us go through the analysis of Raw along with winners and highlights. 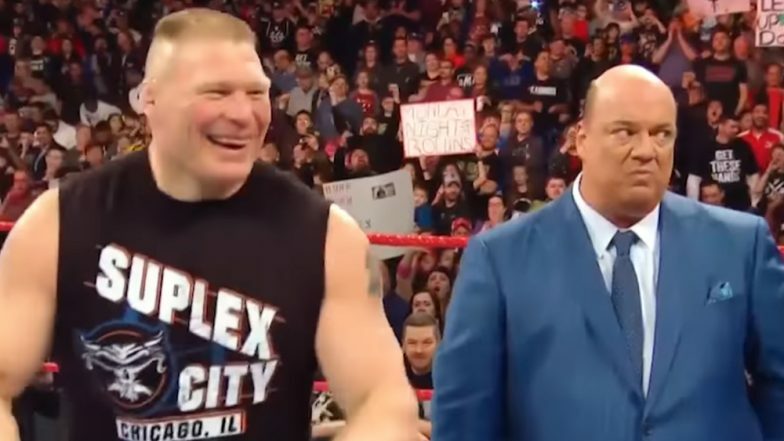 WWE RAW Results Mar 11, 2019: Monday Night Winners, Highlights, Full Analysis and Commentary. The show kicked off with WWE Universal Champion Brock Lesnar and his manager Paul Heyman. They were interrupted by Drew Mckintyre when they were discussing the Scottish psychopath brutalizing The Shield members Roman Reigns and Dean Ambrose last week on Raw. After Mckintyre challenged Roman Reigns to fight at WWE mega's event Wrestlemania, he was attacked by a chair shot from behind by Seth Rollins, the No.1 contender for WWE Universal title. The freaking Rollin then confronted the champion, Lesnar. Will the Undertaker Appear at WrestleMania 35? The Deadman Could Show His Glimpse at the Grandest Event of WWE. Kurt Angle announced that he would be facing Baron Corbin at WrestleMania 35. He then met Chad Gable in a one one one match, where he defeated Gable by making him submit on the ankle lock. Batista gave an interview satellite interview to Michael Cole, where he discussed his side of rivalry with Triple H. He said that the Game is just a selfish cerebral assassin. In 2010, the Animal left the company because Triple H wanted to put him down as a boss, instead of helping him in his career growth as a friend. Ronda Rousey is continuing her nondisciplinary action by attacking WWE security staff. This past episode on Raw she defended her title against Dana Brooke. This match ended quickly, where Rousey savaged the underdog, Brooke. After the match, the Raw Women's champion Rousey along with the support by her husband, the UFC Heavyweight Champion, Travis Browne assaulted referees and other officials. 1. Finn Balor and Braun Strowman defeated Bobby Lashley and Lio Rush. 2. Elias won against No Way Jose and announced that he would be headlining musical act for WrestleMania 35. 3. WWE women's Tag Team champion Sasha Bank defeated Natalya via disqualification, as the match was interrupted by Nia Jax and Tamina. Natalya friend Beth Phoenix told before the match that she would come out of the retirement at WrestleMania 35. 4. Ricochet won the one on one match against Jinder Mahal. 5. Apollo Crews defeated Baron Corbin. 6. Drew Mckintyre won the match against Seth Rollins thanks to the interruption by Brock Lesnar, which distracted Rollin in the match against Mckintyre. Now as a WWE fan, we are eagerly waiting for WrestleMania 35, where lots of exciting actions are expected. It will be interesting to see whether WWE make a different champion or not at WrestleMania 35. Also, the championship match like the Intercontinental champion is not yet booked. The wrestling company should expedite the booking of remaining title matches to built up a fantastic storyline.